Acclaimed trombonist Jay Hao was born in Tsingtao, China, and has been continuously demonstrating his innate talent and passion for music since he was a child. Jay Hao started music studies at the age of 7, and at the age of 13 he took his first trombone lesson under the instruction of Mr. Jiang De Cao, Principal Trombonist of the historic Central Symphony Orchestra in Beijing, China. At the age of 16, Jay Hao entered the Affiliated Music High School of the Central Conservatory of Music in Beijing for professional training. Three years later he won his first position as the second trombonist of the China National Symphony Orchestra and later became the principal trombonist at the early age of 23. In 1990, Jay Hao went abroad to pursue further study at the School of Music and Theater in Hannover, Germany, studying with Hilmut Seifelt and Joh Doms. Jay Hao continued his studies abroad at Indiana University with Jay Friedman. Jay Hao returned to China in 2000 to perform as the principal trombonist for the China Philharmonic Orchestra, contributing to the great legacy of the orchestra for nearly a decade. He began his tenure as a professor at Shanghai Conservatory of Music in 2005. 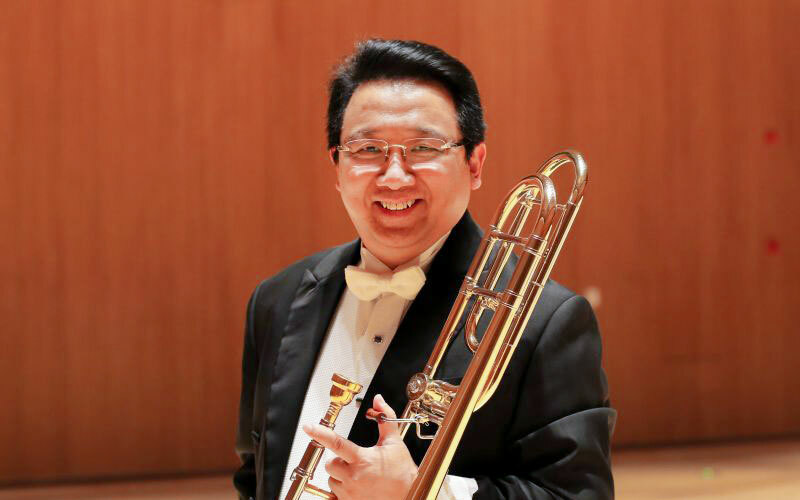 Today, Jay Hao actively maintains multiple positions simultaneously, including principal trombonist at Shanghai Symphony Orchestra and professorships at both Shanghai Conservatory of Music and the Shanghai Orchestra Academy. In 2014, he was awarded the “Magnolia Gold Award” for his extraordinary contribution to Shanghai’s music culture. This honor is a highly prestigious and international award, granted only to the finest and foremost leaders in their professional fields.